Does Antimatter Fall Up or Down? The atoms that make up ordinary matter fall down, so do antimatter atoms fall up? Do they experience gravity the same way as ordinary atoms, or is there such a thing as antigravity? So far, all the evidence that gravity is the same for matter and antimatter is indirect, so Fajans and his colleague Jonathan Wurtele, both staff scientists with Berkeley Lab's Accelerator and Fusion Research Division and professors of physics at the University of California at Berkeley -- as well as leading members of CERN's international ALPHA experiment -- decided to use their ongoing antihydrogen research to tackle the question directly. If gravity's interaction with anti-atoms is unexpectedly strong, they realized, the anomaly would be noticeable in ALPHA's existing data on 434 anti-atoms. What the results do show is that measuring antimatter gravity is possible, using an experimental method that points toward much greater precision in future. They describe their technique in the April 30, 2013, edition of Nature Communications. ALPHA creates antihydrogen atoms by uniting single antiprotons with single positrons (antielectrons), holding them in a strong magnetic trap. When the magnets are turned off, the anti-atoms soon touch the ordinary matter of the trap's walls and annihilate in flashes of energy, pinpointing when and where they hit. In principle, if the experimenters knew an anti-atom's precise location and velocity when the trap is turned off, all they'd have to do is measure how long it takes to fall to the wall. ALPHA's magnetic fields don't turn off instantly, however; almost 30-thousandths of a second pass before the fields decay to near zero. Meanwhile flashes occur all over the trap walls at times and places that depend on the anti-atoms' detailed but unknown initial locations, velocities, and energies. Wurtele says, "Late-escaping particles have very low energy, so gravity's influence is more apparent on them. But there were very few late escaping anti-atoms; only 23 of the 434 escaped after the field had been turned off for 20-thousandths of a second." Fajans and Wurtele worked with their ALPHA colleagues and with Berkeley Lab associates, UC Berkeley lecturer Andrew Charman and postdoc Andre Zhmoginov, to compare simulations with their data and separate gravity's effects from those of magnetic field strength and particle energy. Much statistical uncertainty remained. "Is there such a thing as antigravity? Based on free-fall tests so far, we can't say yes or no, " says Fajans. "This is the first word, however, not the last." ALPHA is being upgraded to ALPHA-2, and precision tests may be possible in one to five years. The anti-atoms will be laser-cooled to reduce their energy while still in the trap, and the magnetic fields will decay more slowly when the trap is turned off, increasing the number of low-energy events. Questions physicists and nonphysicists have been wondering about for more than 50 years will be subject to tests that are not only direct but could be definitive. If antimatter falls upwards, it might explain cosmological observations without resorting to dark matter or dark energy, which are thought to exist because experimental observations can be explained within the framework of conventional theories of the universe. But what if these theories are wrong? A small but steady stream of papers discusses this possibility and are part of the motivation to study how gravity behaves for antimatter. Gravitational mass and inertial mass (resistance to acceleration) are thought to be identical, an assumption known as the weak equivalence principle. As yet there is no direct experimental evidence to the contrary. 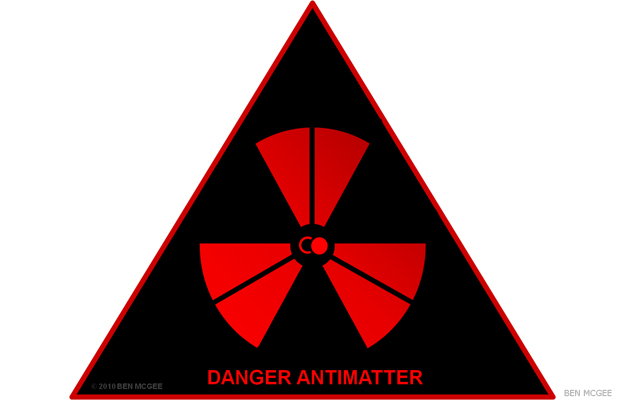 For years there has been continual speculation that antimatter could be different, however. While there are many indirect indications that the weak equivalence principle holds for antimatter as well, there has never been a direct test -- that is, a free-fall test. This work was supported by DOE's Office of Science and the National Science Foundation (NSF) in the United States, and by the following institutions in other ALPHA Collaboration member countries: in Brazil, the National Council for Scientific and Technological Development (CNPq) and the Financing Program for Studies and Projects/Network of High Energy Physics (FINEP/RENAFAE); in Israel, the Israel Science Foundation (ISF); in Denmark, the Natural Science Research Council (FNU); in Sweden, the Swedish Research Council (VR); in Canada, the Natural Sciences and Engineering Research Council of Canada (NSERC), the National Research Council (NRC)/TRIUMF, Alberta Innovates Technology Futures (AITF), and the Research Fund of Quebec-Nature and Technology (FQRNT); and in the United Kingdom, the Engineering and Physical Sciences Research Council (EPSRC), the Royal Society, and the Leverhulme Trust. The authors gratefully acknowledge the efforts of CERN's Antiproton Decelerator team. Lawrence Berkeley National Laboratory (http://www.lbl.gov) addresses the world's most urgent scientific challenges by advancing sustainable energy, protecting human health, creating new materials, and revealing the origin and fate of the universe. Founded in 1931, Berkeley Lab's scientific expertise has been recognized with 13 Nobel prizes. The University of California manages Berkeley Lab for the U.S. Department of Energy's Office of Science. DOE's Office of Science (http://science.energy.gov) is the single largest supporter of basic research in the physical sciences in the United States, and is working to address some of the most pressing challenges of our time.